Park Shin Hye International Fanclub | 박신혜 국제 팬클럽: [NEWS] Heartstrings is Yonghwa's revenge on Shin Hye? 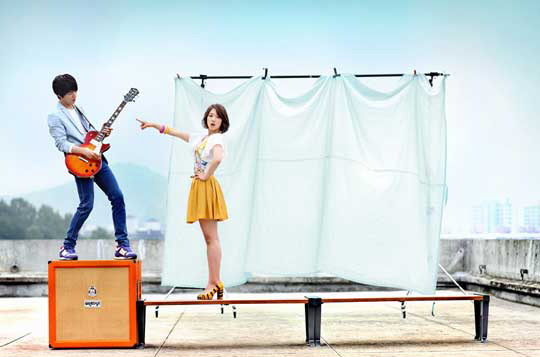 [NEWS] Heartstrings is Yonghwa's revenge on Shin Hye? As the plot of Heartstrings slowly unfolds, one cannot help but to wonder if it is a vengeful story...? Upcoming drama “Heartstrings” released teaser stills of its two leads, Lee Shin (CNBlue’s Jung Yong Hwa) and Lee Gyu Won (Park Shin Hye). The character shots were enough for the drama’s fans to catch a glimpse of the leads’ personalities. Jung Yong Hwa’s Lee Shin is a snobby, prickly guitar prodigy who’s life revolves around his band and guitar. Park Shin Hye’s Lee Gyu Won is a bubbly music student who studies the gayageum, a traditional twelve-stringed Korean instrument. The two will share a bickering, yet cute romance as a college campus couple who share a passion for music. The first episode will air on June 29 (Wednesday). MBC drama Heartstrings is currently filming on sunny Jeju Island.The filming will last only for 2 days . The Jeju parts talk about the beginning of the drama where Kyu Won (Shin Hye) and Shin (Yonghwa) meet for the first time. Jeju is Kyu Won's hometown. The two meet at the airport where the wheel of Kyu Won's carrier bag is lost. Shin derides her as she causes trouble. ohhhhhhhhhhh sounds interesting! I like these types of dramas. So interested now!!!! Thanks Karen! im nso so excited for the two drama hayate the combat butler AND heartstrings!